After the last few days we are all remembering what summer heat in Chicago can feel like. The heat may be breaking for the moment but it will be back over the next few months! Meanwhile a day in the high 70’s or even 80’s is the PERFECT opportunity to leave your AC switched off. If you’re interesting in keeping cool without overheating the environment, here are a few passive cooling ideas to consider. Most of us tend to groan when we hear that the temperature is about to spike, but the number on the thermometer is only part of the story when it comes to the way summer heat makes you FEEL. Human Comfort (from an environmental point of view) is based several factors which include temperature but also Humidity and Air Movement. That’s why the Effective Temperature is a reading which combines all three. One of the human body’s best methods for cooling off is through evaporation. We use the same technique to handle high heat outside in summer or to get rid of our extra internal heat when we’re exercising, namely “by opening pores on the skin and releasing water and salts,” according to MIT researcher Patricia Christie. For the water (sweat) your body kicks out to turn into a gas, latent heat is needed – that means heat is actually absorbed by the process so when sweat evaporates off your skin you feel cooler. When its extremely humid outside (or in) the sweat doesn’t evaporate and you don’t get that cooling effect. Result: that muggy sticky feeling. All this explains why the phrase “yes, but its a DRY heat” means that you might be able to stand it better. On the other hand, you’ll want to make sure you’re rehydrating or your body will effectively cool down by drying right up! In any kind of heat, drink LOTS of water. Air movement aids in evaporation mostly by refreshing the air around your body with air that hasn’t already absorbed any of your evaporated sweat. Again, this only works if the overall humidity level is low enough to keep absorbing evaporated water. A truly humid wind won’t help evaporate (and cool) you any more than still humid air will. You’ll be amazed at how effective sitting, standing or lying in the path of a steady stream of air movement can be for keeping cool in the summer. You don’t need a gale force wind – the slowest setting will often do the trick. Ceiling fans are the most efficient but you might want to create spot breezes with smaller uprights or encourage air flow into and out of your home with a window unit. … especially at night. Take advantage of the diurnal cycle to flush your house out with cooler air at night. You can encourage air to move through your house in several ways but the most important thing is to remember that it needs to MOVE. Just opening one window in a closed off room likely won’t give you any breeze at all. As you open up your house, think about the paths you want the air to follow. Air will move best through your living space if you give it a pathway. Try opening windows on opposite sides of a room or in rooms in opposite sides of the building with open doors between them. Try to make a note of the direction of the wind outside. 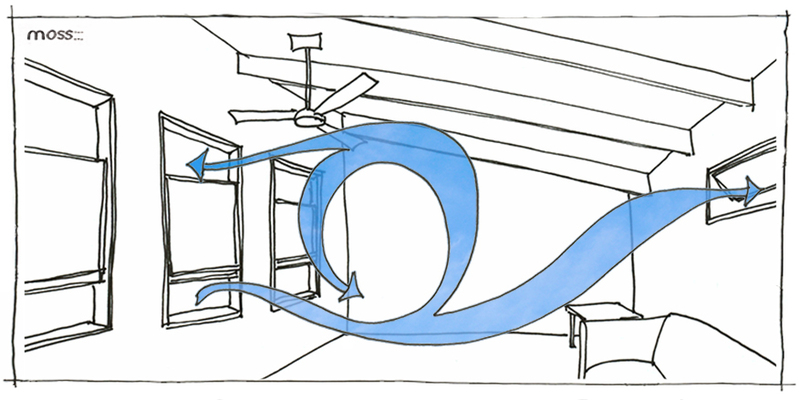 Opening multiple side-by-side windows (IN ADDITION TO CROSS WINDOWS) will give air a more complex movement (creating turbulence) which will circulate air to more parts of your room or home. PRO TIP: If you’re a renter, ALWAYS choose a unit with windows on at least two walls. If all of your available windows are along one wall you will have to use mechanical means (a fan) to get air to come into your place. Heat rises. So if your goal is to get heat out of your house or apartment you’ll want to create a pathway for that to happen. If you have multiple floors, open windows on both of them to encourage hot air to rise out of the upper windows and draw a draft of cooler air in from the lower ones. (This can work even if there are no fans or outside breeze in play.) If you have only one level to play with, you can replicate the effect by opening the top and bottom sashes of windows or fanning air out and up. What you DON’T want to do is let any extra heat into your house in the summer. Closing your curtains (and lining them with a light colored – and light reflecting – material can really help you out here. You can also explore more permanent shading techniques like planting shade trees and shrubbery to keep sun off the outside surface of your building. The more of your interior and exterior space you can keep shaded the better! Check out our April post on yard shading for more on that! Don’t leave the fans on when you leave the room or the house. Remember that a breeze is cooling down your skin by evaporating your sweat, not lowering the air temperature in the room. In fact, since the fan is powered by a mechanical motor, running it when you’re not around to feel the breeze is actually HEATING UP the room. Switch it off when you leave. Your fans aren’t the only thing you should switch off when you leave the room. We should all keep electronics powered down when not in use (to save energy) all year round but hot summer days are the time when it matters even more. If you’re feeling the heat you don’t want to add any extra degrees to the room with a TV you’re not watching, lights you’re not using or forgetting to turn the oven off. In fact, experimenting with no heat food preparation – take advantage of summer’s produce bounty and have a salad rather than heating up your kitchen with dinner prep. Even if you are planning to indulge in a little AC during the peak heat of the day it makes the most sense to start the morning with the coolest temperature you can harvest from the outside air. The idea that its better to keep the AC running all the time but at a higher temperature is a myth. If you do use an AC unit, turn it OFF (not up) whenever you don’t absolutely need it. AC units are best at de-humidifying when they are running at full speed for a burst. Its less efficient to keep it on all the time when you’re not around to appreciate it. So you can really help yourself (and your cooling equipment out) by getting a natural cooling boost during the night with all the windows open.